Foot Levelers custom orthotics are the most ordered custom orthotics in the world. 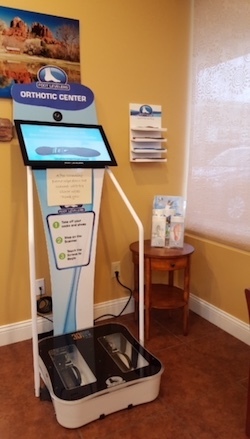 Patients can use our Foot Kiosk at their convenience. This device gets a 3d scan of your feet and analyzes posture. We are able to order individually designed orthotics with 3 arch support based on these 3 D images from our kiosk. Your feet are as unique as your fingerprints. That is why we believe in offering custom made orthotics built especially for your feet. These orthotics are soft and comfortable and provide the support your feet need to reduce foot, knee, and back pain. Our staff can meet with you to discuss the different orthotic options available such as inserts for dress shoes or running shoes, shoe orthotics and sandals.